We chose the Bunless Eden Burger (bad picture of it above), Leon Baked Fries (half eaten box in photo below) and the Acai & Grape Juicy water. The chargrilled chicken thigh was super succulent and freshly cooked. 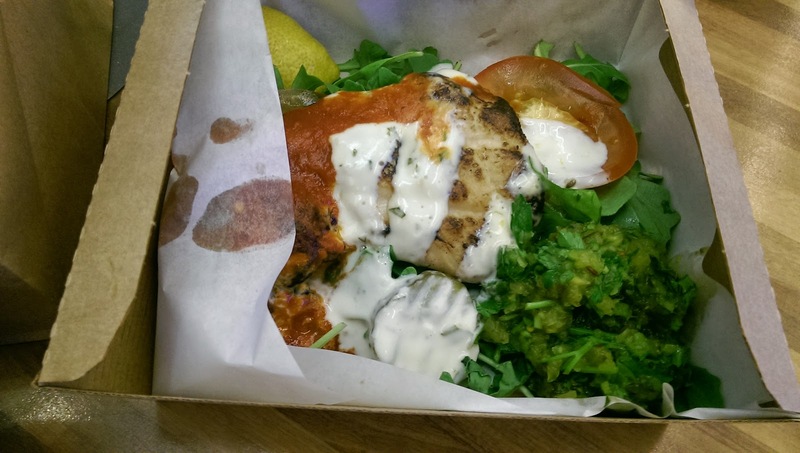 It came along with a pickle-kraut relish, parsley & mint herb salad, chilli sauce, tomato and a bed of rocket…. nom nom nom. 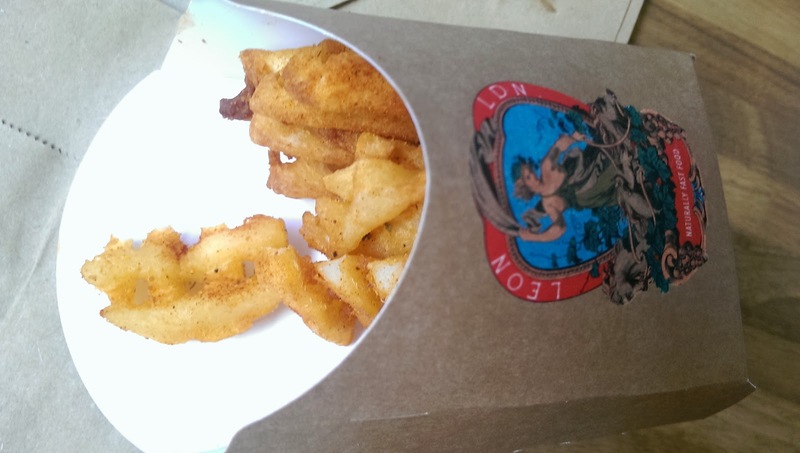 The fries had a paprika style seasoning and came in a criss cross waffle shape. Great size portion, really crunchy on the out side and they went particularly well with the sour cream dip. Ten points for anyone who has already guessed that we dove in to eat them before stopping to take a photo, hence the half eaten shot below. Very fulfilling meal, taste sensation, nothing went to waste and all of this from a fast food place. My one question……why do we not have one (or ten) in Scotland! ….. yes we are still waiting for one in Edinburgh …… what is that all about! 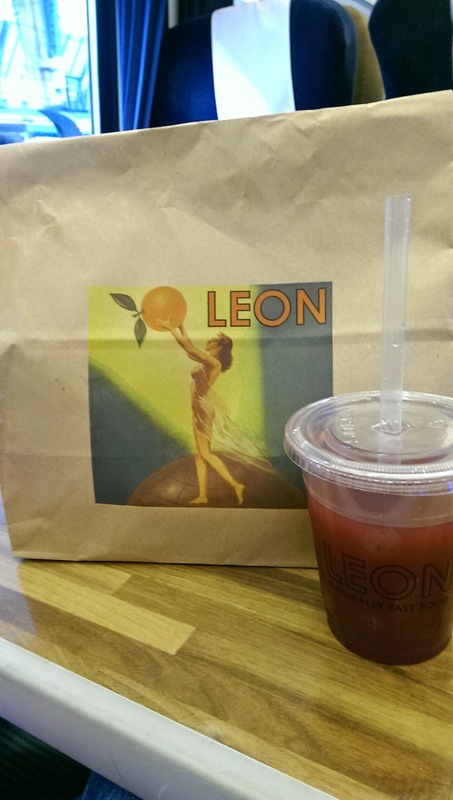 Since I started writing this, I have been on the whole menu at www.leonrestaurants.co.uk and am gutted to be missing out on the breakfast offerings, children’s menu and pretty much everything else. I love they fact that they produce food that is a change from the normal kids meals too. 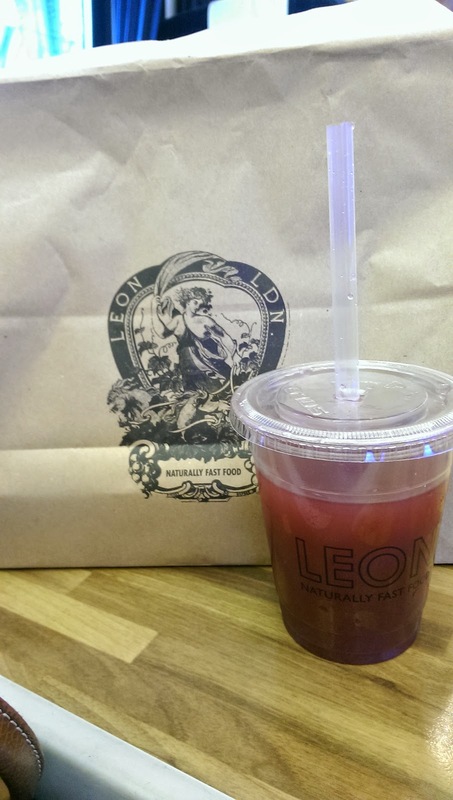 Leon is a revelation to me as I no longer will feel like I have to take food with me if I am out for the day in London just in case I can not find anything suitable. In fact I will intentionally make sure I have nothing with me so I can pay Leon a visit… I will positively go out of my way to find a Leon location. 5* Fifi Friendly place to eat. Next Post Living Nature Blogstar June 2014….yay me! !